I attended the cast and crew screening of Centurion yesterday at Odeon West End in Leicester Square. I was ADR Editor on the film and so was fortunate enough to meet some of the fine actors who appeared in it, including Michael Fassbender and Dominic West. The combination of some great acting performances shot within epic landscapes and tied together by several terrific fight sequences makes for a really entertaining movie. The soundtrack’s pretty damn good too! I went along to the screening with a colleague of mine (who cut the FX) and our wives and, interestingly, the girls loved it, despite (or maybe because of?!) all the graphic gore and decapitation. I remember when I worked on another one of Neil Marshall’s films, The Descent, a few years ago, there was a similarly-themed but much bigger budget film called The Cave that was released at about the same time. Despite it’s financial disadvantage, I believe “The Descent” went on to be the more successful of the two. Likewise with “Centurion”, I see that a big budget, Hollywood take on Roman history is to be released a few months later in the form of The Eagle of the Ninth. It will be interesting to see how the two films fare in comparison. I wish Neil all the best of success with the film. 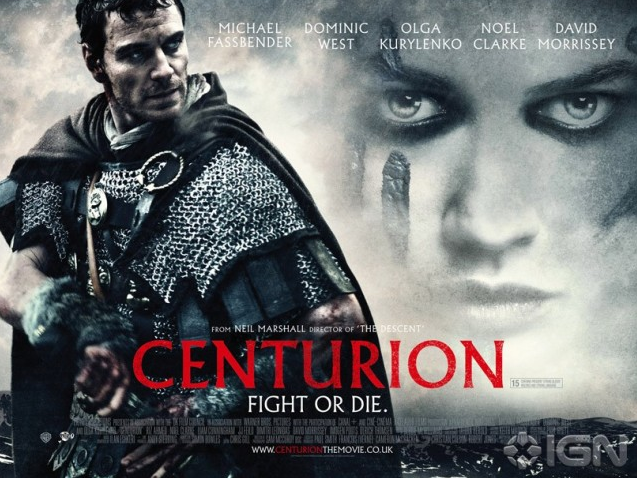 Centurion is released in cinemas on April 23rd.